Love this table. Have it in several colors and its great! Easy to put together and looks expensive. The drawers slide very well and line up perfectly. 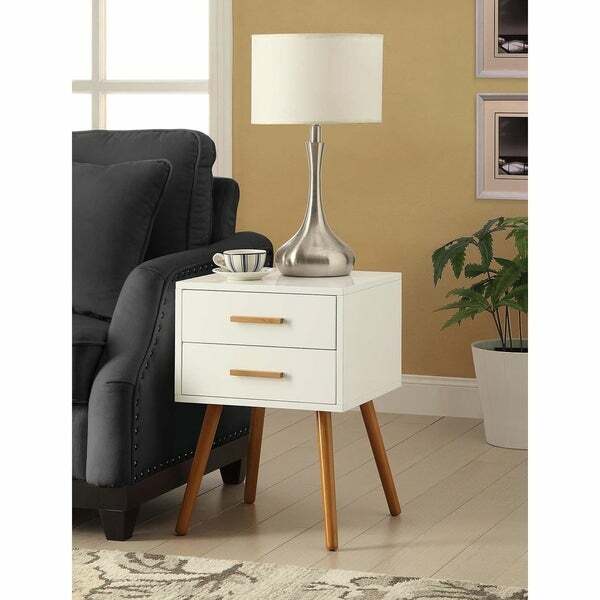 Simple design meets mid-century style with this Carson Carrington Odda end table. The end table features a square box body with two drawers, perfect for storing your must-have items, raised over flared legs that give the piece an artistic and retro vibe. The two-tone end table features brown legs with a white, blue, black, or brown finish to coordinate with your decor. Dimensions 15.75 In. X 15.75 In. X 23.5 In. love the look and quality of this end table. Finish is a bright, high gloss white. Only flaw is that the back is not a finished side. You will need to have it covered/against a wall. Stylish end table that seems sturdy. Takes about 1 hour to put together. Probably works better as an end table rather the a side table for chair as it comes across as slightly bulky but still very functional and good looking. Easy to assemble, sturdy, stylish, clean design, and the finish is shiny white. Love the wooden handles and legs. The drawers are smooth white and glide nicely. Great purchase. This is a great little end table for a child's room. We got the white and it's held up quite well to the torment of being in a kids room! It was easy to put together - just install the legs and it's ready to go! This end table is attractive, although not of high quality - the back piece and drawer bottoms are as thin and flimsy as cardboard. Also, it was a nightmare to put together, took me a few hours - instructions are not detailed and illustrations are small and sometimes difficult to interpret. It does look nice in my son's room, though, and fits well with his other mid-century modern pieces. The white surfaces are very glossy. This table was just what my pre-teen daughter was looking for to give her bedroom a more modern vibe. Assembly was easy and took me about 1 hour to complete. All the parts and hardware were labeled and this certainly contributed to the ease of assembly. Once assembled, the table is very sturdy. Love these end tables! Very cool and modern scandanavian look. Versatile and easy to style. Goes with many different types of decor. Very easy to put together. These end tables are great for the decor that I was trying to coordinate it with. The price was fine for the quality, however I was disappointed at the size. I thought they would be bigger in the room I bought them for. I think they would be best in a smaller sized room. Very cute end table - little, please check measurements before purchasing. But this is exactly what i wanted. It's a little challenging to put together. The instructions are not very clear. But I managed after one or two mistakes. I have a small bedroom, and was limited in size for bed side tables. These are exactly what I was expecting, and true to size. Easy installation. Great for a pop of modern white to a room with a lot of wood furniture. Much better looking in person than on pictures! Drawers come out very smoothly and are spacious enough to hold my art supplies. Aesthetically functional. I bought this for my daughters room. She absolutely loves it! It’s very modern and looks great with her blush pink and gold/silver theme. Would buy again. Pretty cheap quality and drawers do not line up. I had to doctor it with my own drill and repaint it because the handles were not at all the same color as the legs. Overstock’s customer service dept was really helpful, however. It looks just like the picture. Was a bit disappointed that there were scratches already on he outside (right out of the box). The first table took about 45 minutes to put together but the second one was quicker around 20 - 30 minutes. Love it. Got color blue - looks just beautiful. This product is great. It adds real style to my contemporary home. Easy to assemble and easy to keep clean. The drawers are deeper than you'd think. Everyone who has seen them here has loved them. this end table is perfect for a small living space. it was easy to assemble, and the drawers slide easily. it is light weight, so you can place it in several positions in a small living area. "what is the size of the drawer? " "Is the java color the black drawers and brown frame with gold handles pictured? If not, what does java look like"
"Do the drawers just sit in the case, or do they glide on actual drawer hardware?" The latter -- they glide on rails. I love the design and it can go in my bedroom or living room ! So this one is funny. I had bought a one drawer MCM side table almost identical to the one I am purchasing today. But it has just one drawer and despite it only costing $30-40 about three years ago, I think my present one is adorable. Well I walk into the living room one day and hubby has the little side table all set up with his computer, phone and phone stand..AND his, reading glasses, remote and Twizzlers in the little drawer. It’s pulled up to his spot at the couch and says,”Look! I have a new setup!” So what did I do? Instead of getting angry I got online and found a “better” side table! Lol! "I love the lamp on the table...is this item sold on overstock? If so I need the information." Unfortunately, the lamp pictured was a prop, and is not currently available. However, I found that item numbers 17842044, 17327147, 18889082, 17391404 and 18974019 are very similar. "Again, can I get an answer on what is the finish of the wood?" It constructed of a white laminate MDF wood. This end table is approximately 15.75 inches wide x 15.75 inches deep x 23.5 inches high.